Soon after the empires initiated contact with each other they recognized the need for independent institutions, jointly run by all the empires, to handle the numerous issues regarding the relationships between them, such as trade, monetary policies, crime-fighting, and so on. The earliest forms of these organizations were established decades ago and now there are a few dozen that exist of various size. All of the organizations are controlled by a central organization, called Consolidated Cooperation and Relations Command, or CONCORD. One of the largest and most powerful branches of CONCORD is the Directive Enforcement Department (DED). DED is the police force of CONCORD and is by far the strongest armed force in the world of EVE that doesn’t pledge fealty to any one empire. The main responsibility of the DED is to track high-profile criminals. For this they often hire independent contractors (better known as bounty hunters). The DED handles the licenses and legal issues of all bounty hunters for the empires, although some of the empires have been known to bypass the DED in special circumstances. Also, the most notorious criminals are marked as free-for-all targets by the DED. Among the other responsibilities of the DED is aiding customs officials in patrolling areas where smuggling is rife. The DED ships are usually equipped with the latest and greatest in surveillance technology, so their service is always a great support for customs patrols, especially because they are incorruptible. 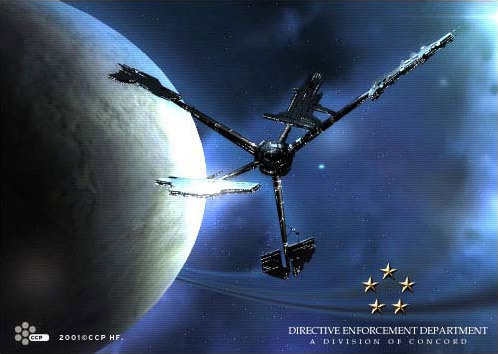 In addition, the DED takes care of all kinds of security issues regarding meetings and conferences between the empires, they lend ships for operations by the other branches of the CONCORD, and they often support local law enforcement in dealing with large-scale crime activity or similar matters. For this the DED often uses their special force unit, named Special Affairs for Regulations & Order, or SARO. The SARO is one of the toughest police units around and are notorious for their brutal, but efficient, methods. They’re mostly used in hostage situations, for the assault of heavily armed pirate havens, and similar tasks.